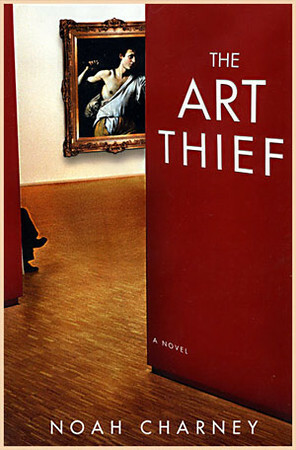 The Art Thief, Noah’s debut novel, was an international best-selling thriller that follows the theft of three paintings, and the hunt to recover them across Europe. The Art Thief is the debut novel by the art historian and writer Noah Charney, first published by Atria in 2007. The novel involves the theft of three paintings, one by Caravaggio and two by the Suprematist Russian painter Kazimir Malevich. The story follows the stolen paintings across Europe, through a web of intrigue that involves art smuggling, forgery, art historical puzzles, and double-crosses. The novel was an international best-seller. Summary Rome: In the small Baroque church of Santa Giuliana, a magnificent Caravaggio altarpiece disappears without a trace in the middle of the night. Paris: In the basement vault of the Malevich Society, curator Genevieve Delacloche is shocked to discover the disappearance of the Society's great treasure, "White-on-White" by Suprematist painter Kasimir Malevich. London: At the National Gallery of Modern Art, the museum's newest acquisition is stolen just hours after it was purchased for 6.3 million pounds. While three separate thefts are simultaneously investigated in three separate cities, the apparently unrelated crimes have more in common than anyone imagines. In each city, the authorities enlist the help of a renowned art investigator, police inspectors, and Scotland Yard. A trail of bizarre clues and intellectual puzzles reveals forgeries, over-paintings, thefts, and double-crosses leading ever deeper into a baffling conspiracy. As of 2009, The Art Thief was available in fourteen languages, as well as ebook and audiobook editions. It sold very well in the United States, though not quite making it onto the US best-sellers list, despite its release at the cusp of the bad market year of 2008. The Art Thief did particularly well in Europe and Canada, and was a best-seller in five countries: Spain, the Netherlands, Canada, Croatia, and Slovenia. In Spain the novel went through five printings within its first few months in print and in the Netherlands, where it was published under the title De Caravaggio Kunstgreep (Luitingh 2008), it sold out of its print run in the first week of sales. In Italy the book was called La Donna del Collezionista (Longanesi 2008). There has been interest in making The Art Thief into a film, and Charney has been asked to write a sequel. The novel received much critical praise from peers and the media. USA Today wrote that the novel contains “Fascinating details about Caravaggio and Vermeer, the lucrative business of art forgery, and the sophisticated thieves who steal priceless paintings.” The Financial Times called it “An engaging whodunit.” The Rocky Mountain News said that the book was “Descriptively brilliant and filled with witticisms, this fine romp features a clever and well-drawn cast of characters, as well as educates readers about real masterpieces and the artists behind them.” The Richmond Times-Dispatch wrote that the novel was “Clever and addictive.… A first-class example of literate escapism.... [Charney] might do for the art world what Tom Clancy has done for the military-technology milieu.” The novel also received praise from fellow writers, including Steve Berry, Don Winslow, and Javier Sierra. It was almost as if she were waiting, hanging there, in the painted darkness. The small Baroque church of Santa Giuliana in Trastevere huddled in a corner of the warm Roman night. The streets were blue and motionless, illuminated only by the hushed light of a street lamp from the square nearby. Then there was a sound. Inside the church. It was the faintest scream of metal on metal, barely perceptible in daylight, but now like a shriek of white against black. Then it stopped. The sound had been only momentary, but it echoed. From out of the belly of the sealed church, a bird rose. A pigeon fluttered frantically along the shadowy chapel walls and swooped through the vaults and down the transept, carving a path blindly through the inky cavernous interior. Father Amoroso woke with a start. Sweat clung to his receded hairline. He looked at his bedside clock. Three-fifteen. Night still clung, outside his bedroom window. But the ringing in his ear would not stop. Then he noticed that it was not only in his ear. He threw a robe over his nightshirt and slipped on his sandals. In a moment he was down the stairs, and ran the few paces across the square to Santa Giuliana in Trastevere which squatted, like an armadillo, he had once thought, but now vibrated with sound. Father Amoroso fumbled with his keys and finally pulled open the ancient door, swollen in the humidity. He turned to the anachronism just inside, switching off the alarm. He looked around for a moment. Then he picked up the telephone. Father Amoroso put the police on hold as he surveyed the interior. Nothing moved. The darkness sat politely around the edges of the church and the moonlight on the nave cast shadows through the pews. He took a step forward, then thought better of it. He turned on the lights. The Baroque hulk slowly sprang to life. Spotlights on its various alcoves and treasures illuminated the empty spaces vicariously. Father Amoroso stepped forward into the center of the nave and scanned. There was the chapel of Santa Giuliana, the Domenichino painting of Santa Giuliana, the confessional, the white marble basin of holy water, the prayer candelabra with the “offerte” sign, the statue of Sant’Agnese by Maderno, the Byzantine icon and chalices within the vitrine, the Caravaggio painting of the Annunciation above the altar, the reliquary that buried the shin bone of Santa Giuliana beneath a sea of gold and glass…Nothing seemed out of place. Father Amoroso returned to the telephone. He cradled the phone, and switched off the lights. The momentarily enlivened church now slept once more. He reset the alarm, then pulled heavily shut the door, locked it, and returned to his apartment to sleep. Father Amoroso bolted upright in bed, eyes wide. He’d had a horrible dream in which he could not cease the ringing in his ears. He attributed it momentarily to the zupa di frutti di mare from dinner at Da Saverio, but then realized once again that the ringing was not in his ears alone. Everyone must have eaten at Da Saverio, he thought for a moment, and then awoke more thoroughly. It was the alarm, once again ringing violently. He looked at his bedside clock. Three-fifty. The sun was still sound asleep. Why not he? He put on his robe and sandals, and tripped down once more into the sleepless Roman night. Father Amoroso, though rarely a profane man, muttered minor curses under his breath, as he fumbled with his keys, rammed them into the heavy wooden door, and pulled it open, leaning back on his heels for proper leverage. This is supposed to be a church, not an alarm clock, he thought. He switched off the alarm, then turned to the church interior. The shadows seemed to mock him. He flicked on the lights with relish. The church yawned into illumination. Father Amoroso picked up the telephone. He put down the phone, and moved once more to the center of the nave. The tiny church gaped, huge and vacant, within the early morning darkness. Nothing seemed amiss. This time, Father Amoroso walked round the inside walls of the church. He moved along the worn slate paving, past rows of extinguished candles, carved wooden pews, and still shadowy alcoves hiding the figures of saints in relief or in oil. Everything was sound. He returned to the telephone. Father Amoroso looked with disdain at the alarm that had twice sounded for no reason, merely to mock him. Perhaps he should not have looked so longingly at Signora Materassi at Mass last Sunday. God has his ways. He would call to have the alarm system checked for faults later on. Perhaps he could still get a little sleep. Father Amoroso switched off the lights. He ignored the smug alarm as he brushed out the door, locked it, and returned home to capture what precious moments of sleep he still could. Father Amoroso jack-knifed out of bed. But then he calmed. It was his bedside alarm. The time was seven, on a Monday morning. That’s better, he thought. The sun was present on the horizon and the day promised its usual Roman iridescence through the humidity of summer. He yawned thoughtlessly and stretched his fatigued arms cruciform. Throwing off his nightshirt, Father Amoroso waddled into the bathroom and emerged a new man, clean and fresh for a new day. He donned his clerical garments and made his way down to Santa Giuliana. He was still ten minutes early. He was not required to open the door until the stroke of eight. The day was not yet too hot, and Father Amoroso decided to steal away for a moment. He slipped into the bar nearby and ordered a caffe. He admired the sunshine on the ancient paving as he sipped his espresso, standing at the bar. Locals passed in the street outside. The occasional tourist bumbled by, map in hand and camera at the ready. He checked his watch. Seven-fifty-seven. He drank up and crossed the square to his church. With a pleasurable sense of leisure, Father Amoroso fumbled slowly at his keys and, finding the right one, twisted and tugged at the great wooden door. When he had it yawned sufficiently, he looped the metal catch to prop it open and allowed the still air trapped within to cool down in the morning breeze that flowed without. He entered the church and threw a look of disdain upon the alarm system as he passed. God, I’ll have to have it fixed today, he thought, then realized his blasphemy and glanced up to Heaven for pardon. He shuffled across the floor to the church office, pushed aside the curtain that hid the door, and unlocked it. He turned and crossed to the center of the nave, stopping briefly to genuflect in front of the altar as he passed. He was about to continue, when he saw it. He couldn’t believe his eyes. Perhaps he was still asleep, he hoped. Then it sunk in, and he stumbled backwards, as he cried out “Dio mio!” The Caravaggio altarpiece was gone.